Darren Clarke is five shots behind stablemate Charl Schwartzel after the opening round in Thailand. Darren Clarke was struggling with blistered feet as he opened with a two under par 70 in the $1m Thailand Golf Open at Amata Spring Country Club. The South African, who was distant second to Lee Westwood last year, fired a seven under par 65 to lead by a shot from 20 year old Thai Thitiphun Chuayprakong with Spain’s Javier Colomo and Swede Daniel Chopra tied for third on five under. 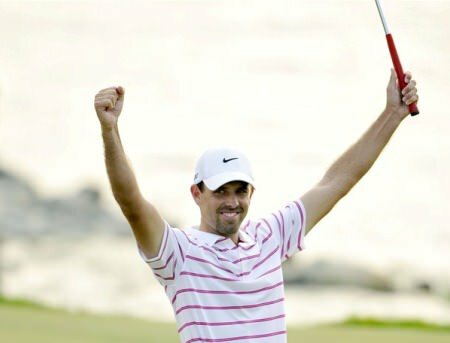 Schwartzel, who has finished fifth, third and second in his last three events, continued to show form that earned him his first Major win last year after recovering from a chest injury which affected much of his game this season. “I’m just playing injury free and that’s allowing me to swing the club better,” said Schwartzel, who made seven birdies in an immaculate round. “When you are playing with injury, you always try to protect that injury and the consequence is a bad swing. Seeking his first win since the 2011 Masters, he added: “It is nice to put yourself in position. You won’t win a golf tournament in the first round but you sure can lose it. I’ve got no expectations. Masters champion Bubba Watson shot a 68 to share fifth place with Sergio Garcia a shot further back after a 69. The American made an eagle and six birdies but also had four bogeys on his debut in the event. Clarke ended the day tied for 10th with the likes of defending champion Westwood and Japan’s Ryo Ishikawa after a round featuring five birdies and three bogeys. He started brightly with two birdies at the first two holes, bogeyed the fifth and then followed a birdie at the par-five seventh with a bogey at the short eighth to turn in one under 35. He dug deep on the homeward half, picking up shots at the par-five 11th and the 13th, where he holed a 15 footer from the fringe for a two to get within four shots of clubhouse leader Schwartzel. The Dungannon golfer couldn’t pick up another shot at the par-five 15th, flying his third well beyond a tight front pin before deftly chipping stone dead from just off the back of the green. But he bogeyed the par-three 17th and then hit the hole with a 10 foot birdie chance at the last as he seeks his first win since last year’s Open Championship. The Ulsterman revealed after the Pro-Am that his blisters would not stop him competing this week. At the Nelson Mandela Championship at Royal Durban, the first event of the 2013 European Tour season, no play was possible due to waterlogging. While the tees and greens were perfectly playable, torrential recent rain has left the fairways and rough in an unplayable condition, meaning a day off for Ireland’s Damien McGrane and Peter Lawrie. Tournament director Mikael Eriksson told Sky Sports: “The fairways are very waterlogged. The course hasn’t improved as much as we hoped it would overnight and further rain early this morning put us back another few hours. “The forecast wasn’t bad at all for today and we hoped the course might have dried out a little bit more, but it hasn’t actually. “We tried early this morning to shorten the golf course, made a couple of par fours into par threes, one par five into a par three as well, in an attempt to start, but with the additional rain as we were trying to restart it didn’t work. Darren Clarke finished tied for 50th as England’s Lee Westwood fired a final round 67 to win the US$1 million Thailand Golf Championship and move back into the world's top 30. European Ryder Cup skipper Darren Clarke got a front row seat as Gleneagles hero Jamie Donaldson opened with a nine-under-par 63 to take the first round lead at the Thailand Golf Championship at the Amata Spring Country Club on Thursday. Darren Clarke shot a 65 on his return to action in Mallorca. Credi: golffile.ieDarren Clarke remained in holiday mood when he opened with a five under par 65 to trail leader Gregory Bourdy by just two shots in the Iberdrola Open in Mallorca. Five weeks after his last tour start and recharged following a two-week break in the Bahamas, the Ulsterman had seven birdies and two bogeys at Pula Golf Club to share third place. 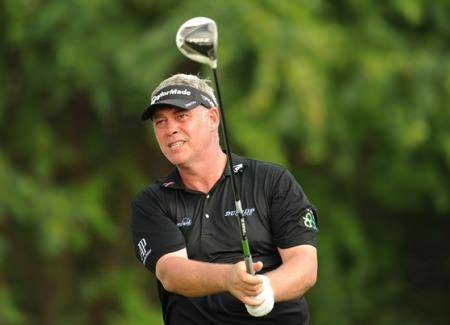 Darren Clarke is on track for a good finish in Thailand. Picture via AsianTour.comDarren Clarke might be 13 shots behind leader Chrl Schwartzel but he’s still on course for his best strokeplay finish since he won The Open more than 16 months ago.